QueuePro PRO300 4.9m x 50mm Belt Barrier | Order Today! The QueuePro belt barrier system is the premium end of the retractable belt barrier spectrum. 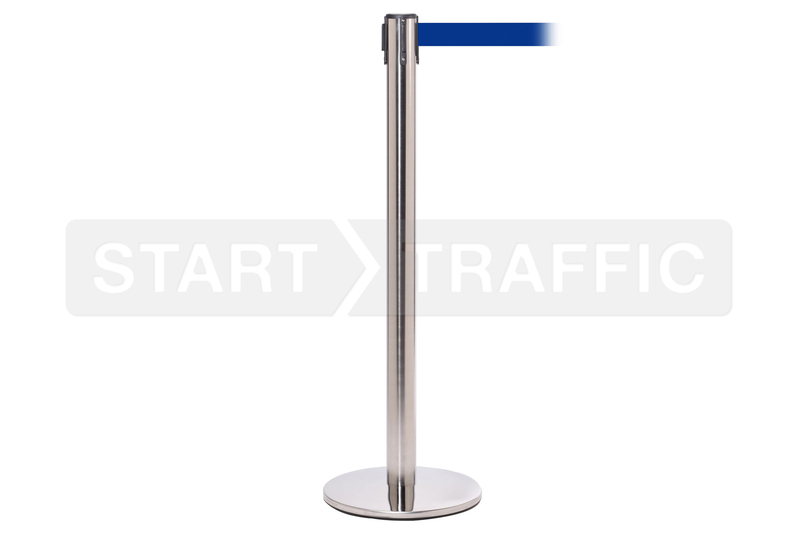 The barriers are stylish and durable, which has made them to "go-to" choice for airports, hotels, retail outlets, cinemas and shopping centres. The 300 model offers a post design fitted with a 4.9metre long belt. The belt is longer than the market average and provides the ability to use 45% fewer posts per run. Offering a step up in quality from the QueueMaster range while still not breaking the bank. 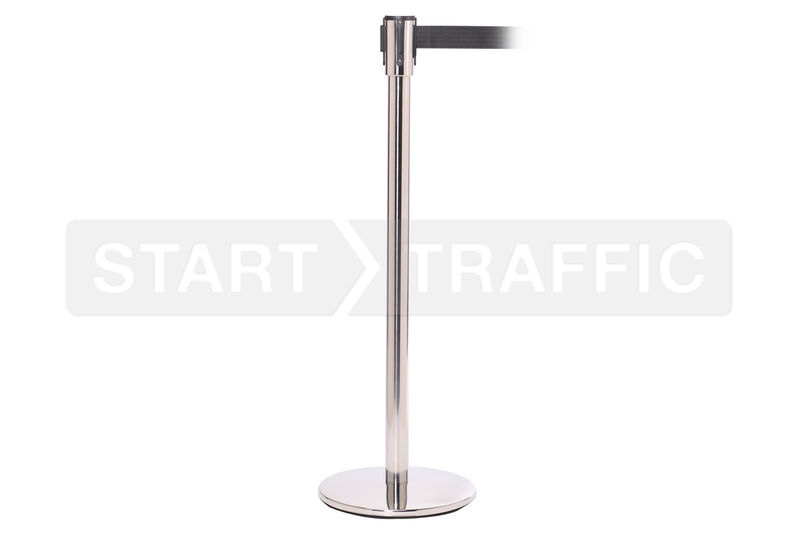 These stanchions will suit almost any application where a premium look is desired. Superior Floor Protection - The QueuePro line of barriers features the best floor protection in its class of barriers. A heavy-duty rubber ring provides a buffer against the cast iron base, preventing scuffing or drag marks. The base is heavy duty and will last the full life of the barrier. Locking Belt - A simple tab on the end of the belt prevents it from being accidentally unlocked, and the belt retracted. Belt Braking System - Cheaper items on the market do not have a brake feature. The QuePro range features a brake that restricts the speed that the belt retracts at, preventing "whipping". Universal Connectors - This post will work with all favourite brands on the market. If you are unsure if this will work with your specific setup, give us a call. This model features a slim design post at only 50mm in diameter; it can be seen here: QueuePro 201. The 250 features a slightly sleeker looking 60mm post that gives a streamlined appearance. This model offers all the features of the 250 but incorporates a second knee level belt you can view the QueuePro 250Twin here. Need a longer belt? The QueuePro 300 is the model for you. It houses a long 4.5metre belt with a thicker 75mm diameter post. We can tailor the QueuePro 300 to your specific requirements. It is available with different colour belts and posts to fit your needs. If you need anything outside of the options above, give us a call we will be happy to help. An extended three-year manufacturers guarantee ensures peace of mind on the QueuePro line of products, safeguarding you against mechanical failure. Looking for more information or have questions regarding the QueuePro 201 system? Give our sales team a call; they will be happy to discuss discounts, customisation and anything else you may need to know. They are available during office hours on 01905 794 875.